Update (2013-01-23): The new org-mode removed (org-make-link), so I replaced it with (concat) and uploaded a new example-file: org-custom-link-completion.el. 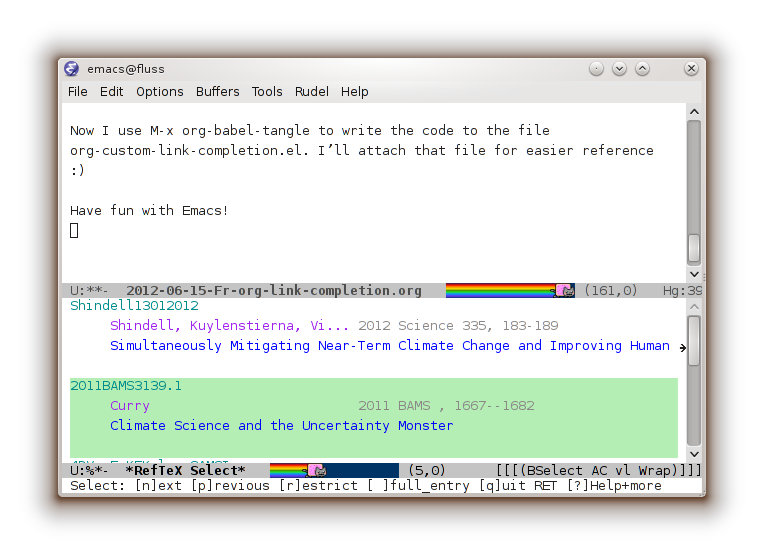 I recently set up custom completion for two of my custom link types in Emacs org-mode. When I wrote on identi.ca about that, Greg Tucker-Kellog said that he’d like to see that. So I decided, I’d publish my code. For some weeks I had copied the info into the links by hand. Thus an entry about a paper looks like the following. This already suffices to be able to click the links for opening the PDF or showing the bibtex entry. Entering the links was quite inconvenient, though. The trick to completion in org-mode is to create the function org-LINKTYPE-complete-link. Let’s begin with the papers-links, because their completion is more basic than the completion of the bib-link. First I created a helper function to replace all occurrences of a substring in a string1. "Create a papers link using completion." The real magic is in read-file-name. That just uses the file-completion with a custom command prefix. And that’s it. A few lines of simple elisp and I have working completion for a custom link-type which points to research papers - and can easily be adapted when I change the location of the papers. Remember: This is free software. Reuse and learning from existing code is not just allowed but encouraged. "Create a bibtex link using reftex autocompletion." ; Reftex should use the org file as master file. See C-h v TeX-master for infos. ; don’t ask for the tex master on every start. And that’s it. My custom link types now support useful completion. For papers, I get an interactive file-prompt to just select the file. It directly starts in the papers folder, so I can simply enter a few letters which appear in the paper filename and hit enter (thanks to ido-mode). For bibtex entries, a reftex-window opens in a lower split-screen and asks me for some letters which appear somewhere in the bibtex entry. It then shows all fitting entries in brief but nice format and lets me select the entry to enter. I simply move with the arrow-keys, C-n/C-p, n/p or even C-s/C-r for searching, till the correct entry is highlighted. Then I hit enter to insert it. And that’s it. I hope you liked my short excursion into the world of extending emacs to stay focussed while connecting seperate data sets. I never saw a level of (possible) integration and consistency anywhere else which even came close to the possibilities of emacs. And by the way: This article was also written in org-mode, using its literate programming features for code-samples which can actually be executed and extracted at will. PS: Should something be missing here, feel free to get it from my public .emacs.d. I only extracted what seemed important, but I did not check if it runs in a pristine Emacs. My at-home branch is “fluss”. 1 : Creating a custom function for string replace might not have been necessary, because some function might already exist for that. But writing it myself was faster than searching for it. You can replace "org-make-link" (which was deleted from org) by "concat". Nice, thank you for the info! Thanks for making your set up public I've found it v useful!